Following criticism over Labour Party's failure to confront anti-Semitism within its ranks, Facebook account linked to Corbyn disappears. The personal social media account of Labour UK leader Jeremy Corbyn was deactivated, following criticism of Corbyn’s defense of anti-Semitic caricatures, and revelations that Corbyn’s account was a member of social media groups used to spread anti-Semitic propaganda. British media outlets reported Sunday afternoon that the personal Facebook account of Labour Party chief Jeremy Corbyn had disappeared from the network on Sunday. Critics have charged the left-wing lawmaker with permitting anti-Semitism to thrive in the UK’s second largest party, while allying himself with fringe anti-Israel elements. Last week, thousands of protesters took to the streets to condemn Corbyn over his failure to confront anti-Semitism within his own party. 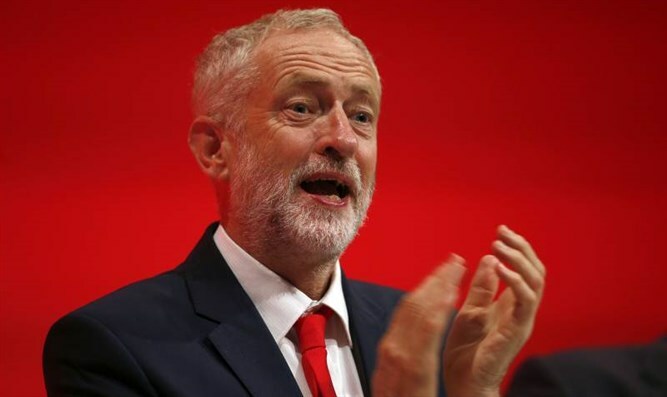 Corbyn responded with a letter of his own in which he stressed to Jewish leaders has claimed that he is a “militant opponent” of anti-Semitism, yet has been criticized in the past for referring to the terrorist organizations Hamas and Hezbollah as his "friends" and for refusing to condemn the groups despite being urged to do so by local Jewish groups. The Labour UK leader also took fire for his membership in a number of Facebook groups used to spread anti-Israel and anti-Jewish propaganda, as well as Holocaust denial. On Sunday, Corbyn’s personal Facebook account was deactivated, though his official public account remains active. According to a source close to Corbyn, the Labour leader deleted his personal account “so he is just using one account,” the source told the Daily Mirror.